But these plans aren’t to the benefit of indigenous Bedouin communities. Adalah’s Suhad Bishara says that “most of [Israel’s] development plans are directed to bringing Jewish communities to the area, especially in the Naqab.”Instead of providing them with badly needed services, in recent years the Israeli government has sought to forcibly transfer tens of thousands of Bedouins living in unrecognized communities in the Naqab — a scheme known as the Prawer Plan.Mass protests scuppered this plan, but Adalah says that the high court ruling on Atir and Umm al-Hiran “gives the state broader legal scope for destroying these communities.”And so residents like Ahlam Khalil insist on recognition — not demolition.Silvia Boarini is a photojournalist based in Bir al-Saba and is currently working on a documentary about Naqab Bedouins. The vast expanse of the Naqab desert. The Bedouin community, numbering approximately 230,000 people, represents 31 percent of the Naqab’s population. But only 18 out of the existing 133 developments in the area are designated for the Bedouin populations, according to Israeli government figures. There are some additional 40 villages not recognized by the state. A home in Umm al-Hiran. Clothes flutter in the wind outside Ahlam’s house in Atir. Muntaha Khalil, Ahlam’s sister, holds her baby Naima in Atir. “The state must recognize our village, we like living here, like this,” says Ahlam. The mosque in Umm al-Hiran. “The is no justification, neither moral nor legal, for demolishing the villages,” says Suhad Bishara, an attorney with the rights group Adalah. 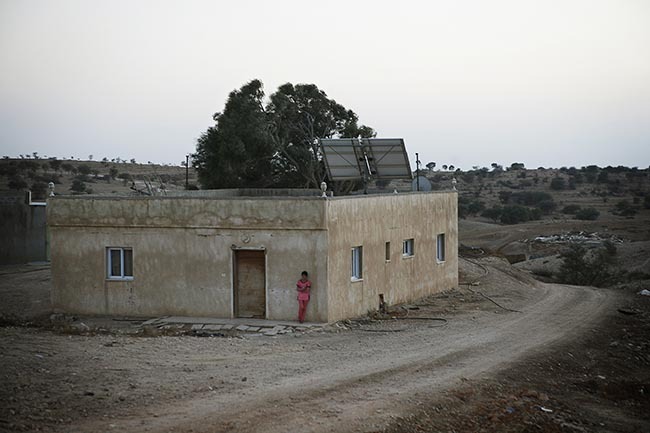 A home in Umm al-Hiran, where despite the lack running water and electricity, residents have built a thriving community. Ahlam Khalil films in Atir; her footage is collected by the Negev Coexistence Forum for Civil Equality, which uses it for advocacy purposes. “We are able to get pictures of demolitions and police brutality or police coming into village on a daily basis, and we use this material in reports and we deliver it to the media. It’s a powerful tool when it’s coming from the community itself,” Haia Noach, director of the group, said. A view of Hura, where the Israeli government wants to forcibly transfer the residents of Atir and Umm al-Hiran. Hura is one of seven townships planned by the government to urbanize the agrarian Bedouin population since the 1960s. “The future of the Bedouins is in their villages. Israel should recognize them and the rights of the Bedouins as citizens,” said Kaed Abu al-Qian, the deputy mayor of Hura.